Colombia’s government and the country’s last-standing guerrilla group, the ELN, announced on Thursday they are seeking a new bilateral ceasefire in support of ongoing peace talks. In a joint statement, government negotiator Gustavo Bell and ELN negotiator “Pablo Beltran” said that on Monday they will meet with representatives from the United Nations and the Catholic Church to review the ceasefire that ended in January. UN observers and the church were monitoring this ceasefire that was marred by irregularities, but drastically improved the humanitarian situation in areas where the guerrillas exercise control. These talks “will define the political and technical aspects that will allow for a mandate to be given for the design of a new ceasefire,” the negotiators said. The government and the ELN also vowed to respond to a proposal from communities in the war-torn Choco province over measures that would reduce suffering in the Pacific region. The talks that seek to end more than half a century of violence have been dominated by distrust between the warring parties. Furthermore, the government has been unable to generate public support for the talks after decades of violence and war propaganda. The Colombian armed conflict, in which multiple illegal armed groups participated, left more than 260,000 Colombians dead, 80,0000 missing and more than 7 million displaced. 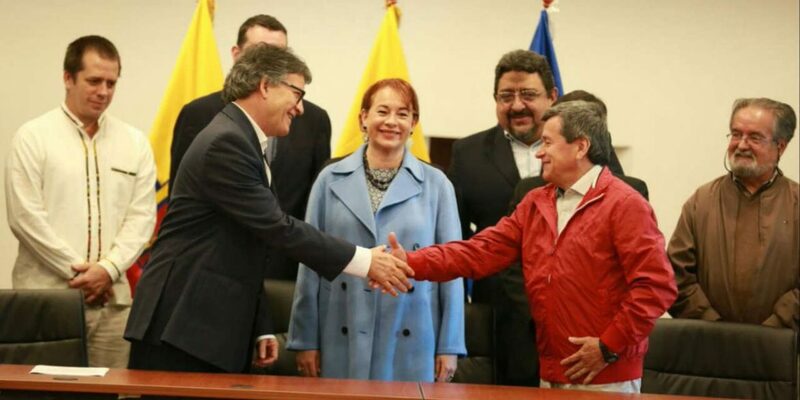 The administration of President Juan Manuel Santos agreed to peace with the FARC in December 2016 and has been engaged in formal talks with the ELN in the Ecuadorean capital of Quito since February last year.